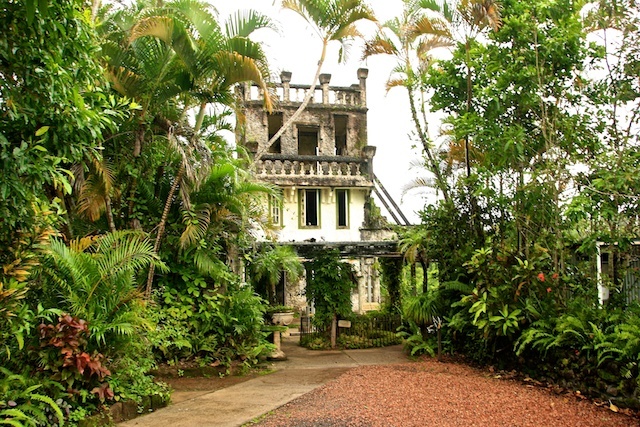 In Far North Queensland's jungle there are the remains of a Spanish castle in a place called Paronella Park. Ever since I heard about this place I have wanted to visit it. On our recent trip to FNQ we did exactly that, thanks to our travel buddy Ann for organising it. Unfortunately it was a dull and wet day. Overlooking Paronella Park from the swinging bridge above the Mena Falls. 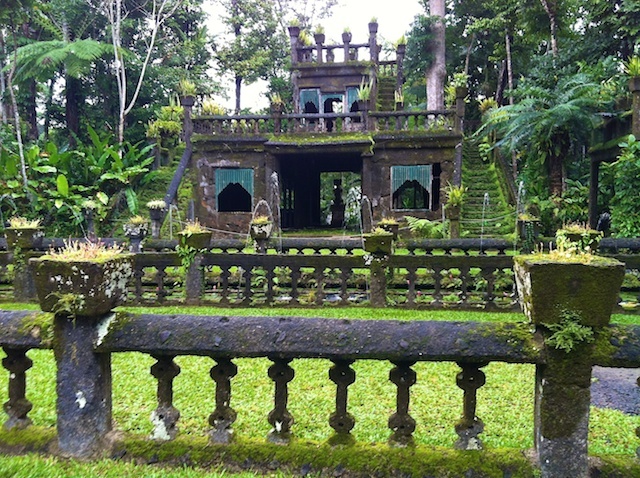 The story of this castle is fascinating. I hope you have time to read it. In 1913 José Paronella left his fiancée Matilda in Spain and sailed to Australia to find a better life for himself and Matilda. He arrived in Innisfail just south of Cairns. He worked hard on the sugar cane fields and then created his wealth buying , improving and selling cane farms over the next 11 years. 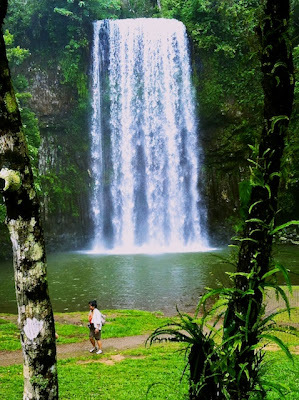 While travelling through the beautiful rainforest he found a spectacular place on the Mena River beside the beautiful Mena Falls for his dream to build a castle where he could entertain large numbers of guests. His dream included a ballroom, a movie theatre, tennis courts, a swimming pavilion, cafe, boating, picnic areas and magnificent gardens. He returned to Spain to marry his Matilda but alas she had married another. Determined to sail back to Australia with a bride, he married Matilda's younger sister, Margarita. One year later, in 1929, the happy newlyweds purchased the land for José's dream. 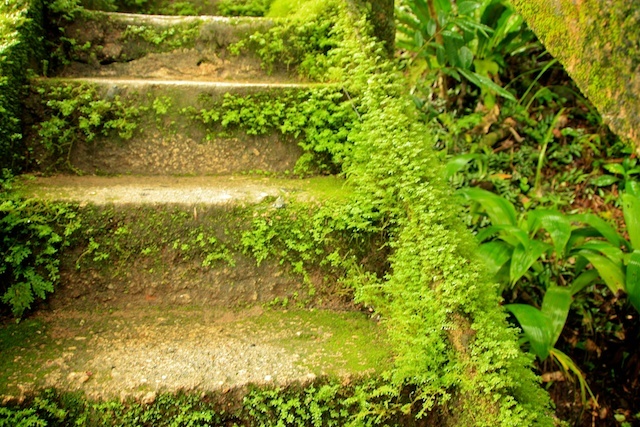 Firstly he built the 'Grand Stairway" to shift building materials from the lower level to the upper level where he hand built a stone cottage to live in while he built his dream. Then he and his work crew set about building an entertainment area. It included a movie theatre which was converted into a grand ballroom on weekends with live bands and a massive mirror ball reflecting pink and blue lights. 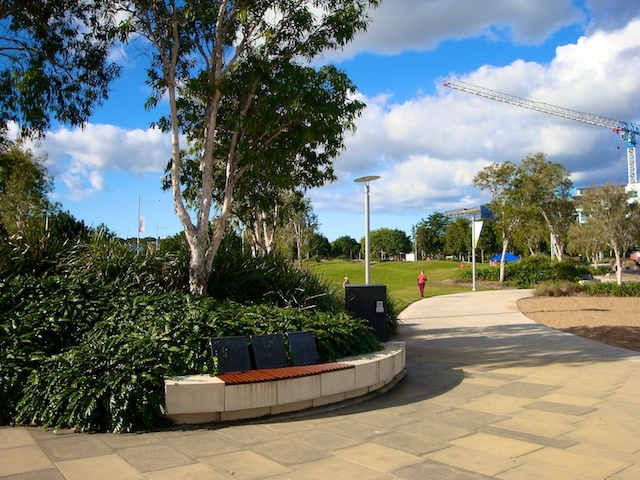 At the bottom of the stairs he built a picnic area with concrete tables and benches. 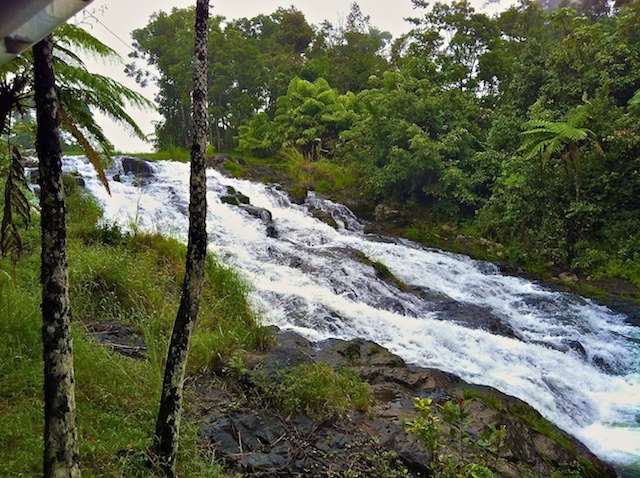 You can see them better in the first photo which I took from the suspension bridge above the Mina Falls. He also had built a diving tower here but it doesn't exist today. 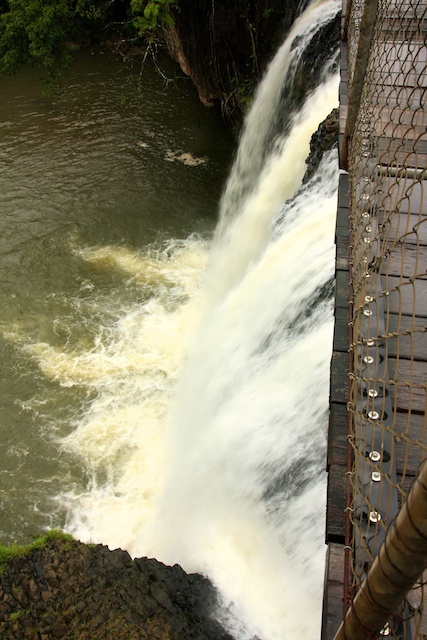 In 1933 José built a hydro electric power plant by the side of the falls which has been renovated today and supplies the power for the now tourist park. Also on the lower level José built refreshment rooms/pavilion and change rooms for swimmers. A fountain which is working again and tennis courts. José made a Lover's Lane which enters a tunnel dug by hand. 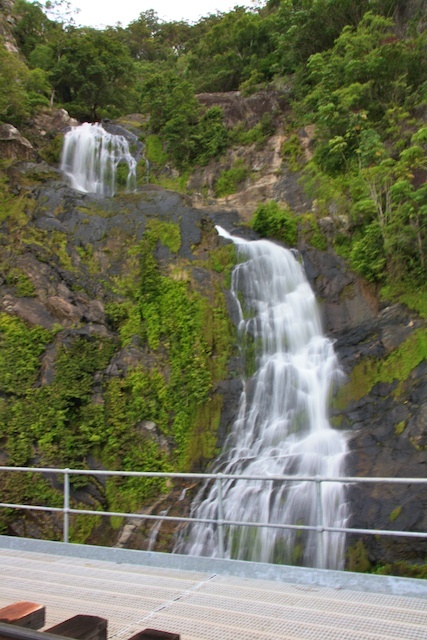 It leads to the delightful Teresa Falls which he named after his daughter. 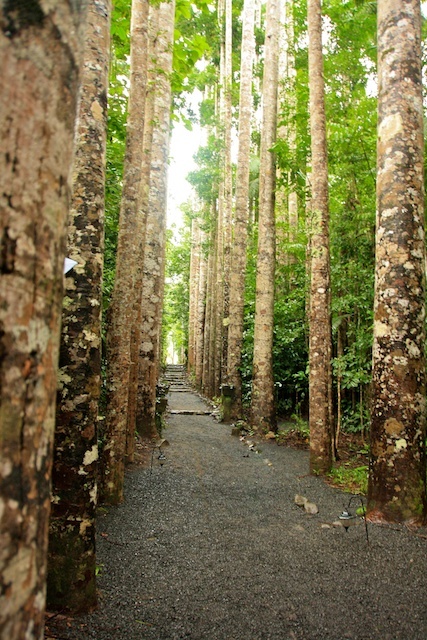 7000 trees were planted on the 13 acre property and it is a delight to walk through these gardens which includes Palm Grove, Bamboo Forest and The Meadow. 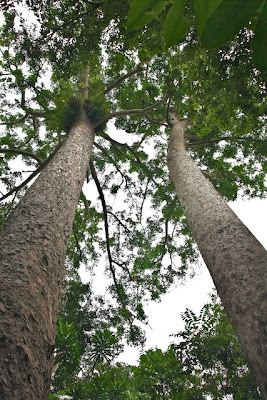 The avenue of huge Kauri Trees tower over the forest. José also made a museum with a collection of guns, timbers, coins and dolls. 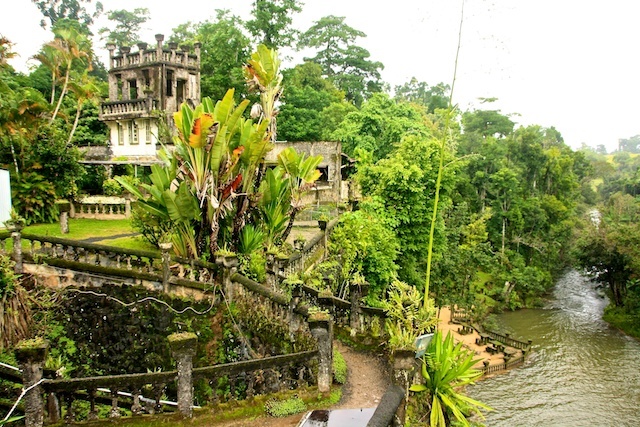 he opened his home and castle to the public in 1935. In 1946 the park and pavilion were damaged by floods but the Paronella's repaired and replanted and opened for business in 6 months. José passed away in 1948 leaving Magarita and daughter Teresa and son Joe as custodians of his dream. Paronella Park was sold in 1977. In 1979 the castle was destroyed by fire except for the stone work. In 1986 a cyclone almost ruined what was left. 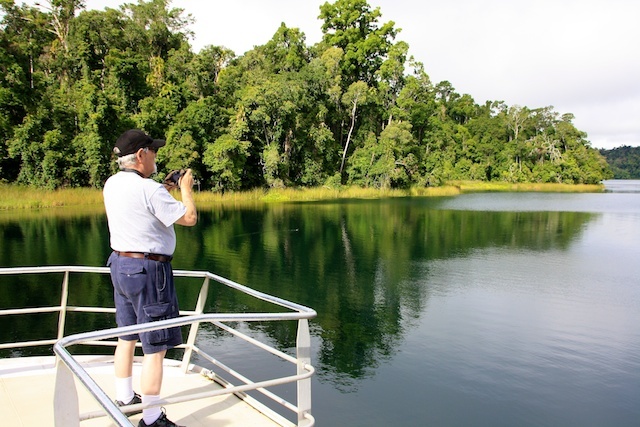 In 1993 Judy and Mark Evans rediscovered the almost lost park and envisaged reviving José's dream with his appreciation of beauty and warm hospitality. 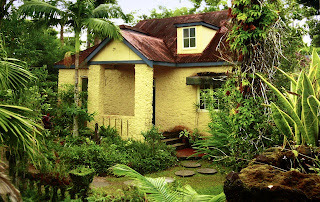 They bought the property and they are returning it to its former glory but staying true to its historic and eco values. They have also had damage from 2 cyclones. Too soon it was time to board the bus and head back to Cairns a 45 min drive. But first I braved the swinging bridge to look over the Mena Falls and to take the first shot on this post. 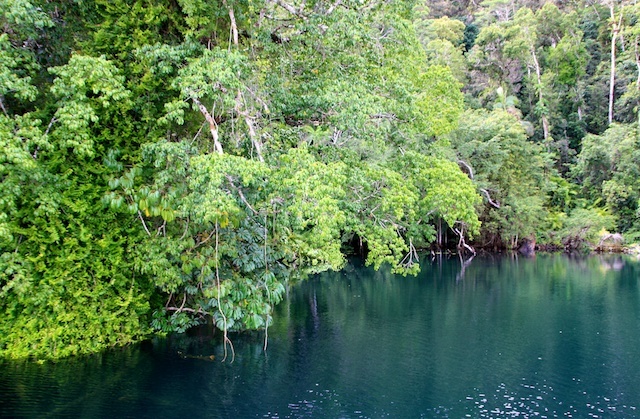 On our day tour from Cairns we left Lake Barrine and drove in our little bus deep into the rainforest. Our driver guide took us for a boardwalk through the jungle where we saw huge stinging plants and plants that grabbed you with their millions of thorns as you brushed past them. 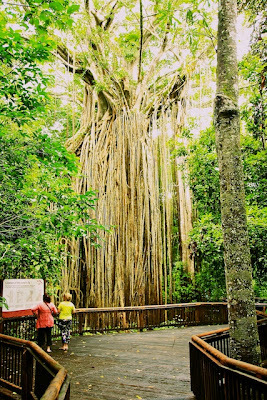 Then we came upon the most amazing tree near Yungaburra. 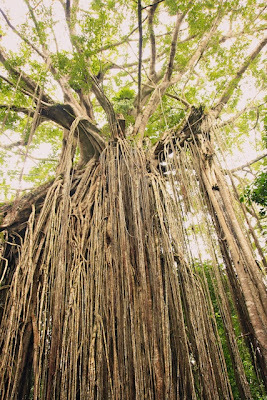 It is a Curtain Fig Tree a member of the Strangler Fig species (Ficus virens) The Curtain Fig starts growing in the top of a host tree and then sends down hundreds of aerial roots like a curtain to take hold in the ground and then the host tree dies. In this case the tree fell onto another at a 45° and the roots form a very wide curtain, which I couldn't get all into the photos. The skies were grey and light rain falling. This Curtain Fig Tree is about 500 years old. They are only found in the rainforests of northern Australia. 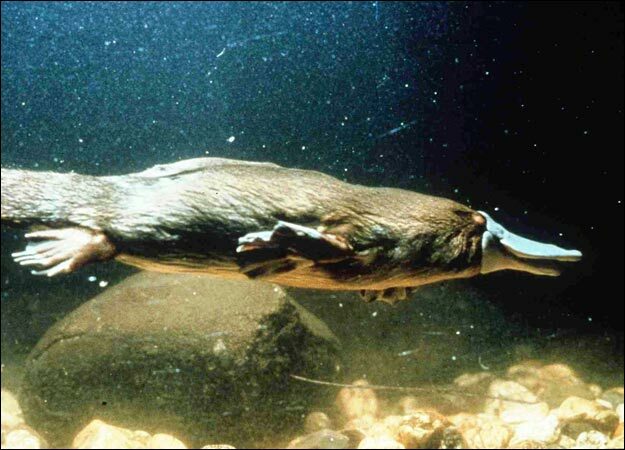 Then we went to a creek where we were lucky to see the elusive platypus, an extremely shy monotreme. 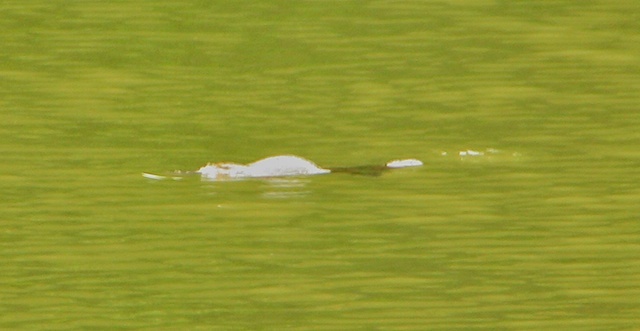 They spend most of their time feeding on worms and other riverbed creepy crawlies so it is very hard to capture them as they are only on the surface long enough to take a breath and you never know where they are coming up. Then we were off to see the waterfalls. 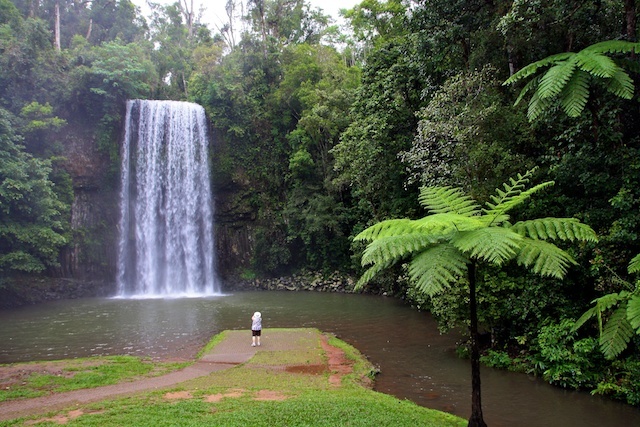 The first and most spectacular was the Millaa Millaa Falls. You can swim here but we didn't. We climbed aboard again and drove on to an organic dairy farm for a cheese and yoghurt tasting. I was accosted by a colourful cow on the verandah. 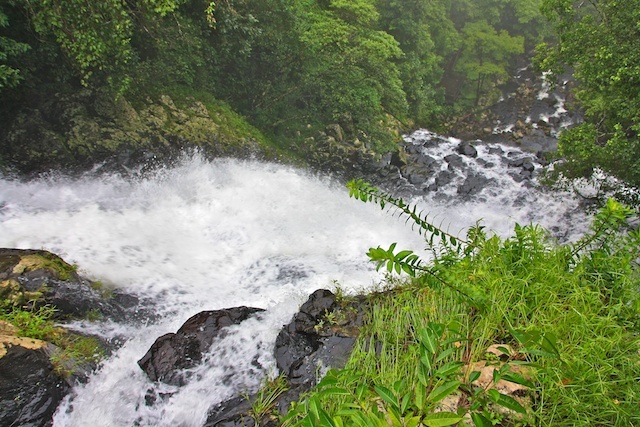 then the water plummets over a precipice and crashes onto the rocks a long way below. Our driver /guide has made friends with a local. 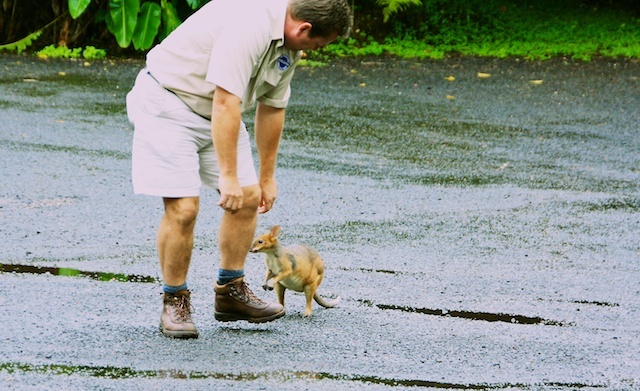 (I'm not sure what kind of wallaby it is) He hopped after the driver to the gazebo to say hello to us and to scrounge some food scraps. Then we pushed on to the next attraction, Crawford's Lookout overlooking the Johnstone Gorge. 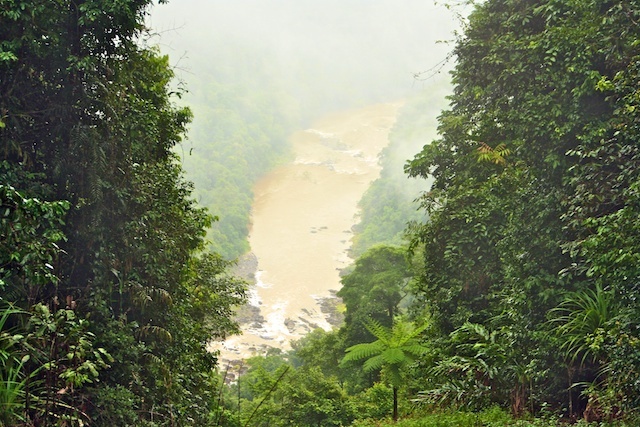 The rain was like a mist, typical of rainforest weather. 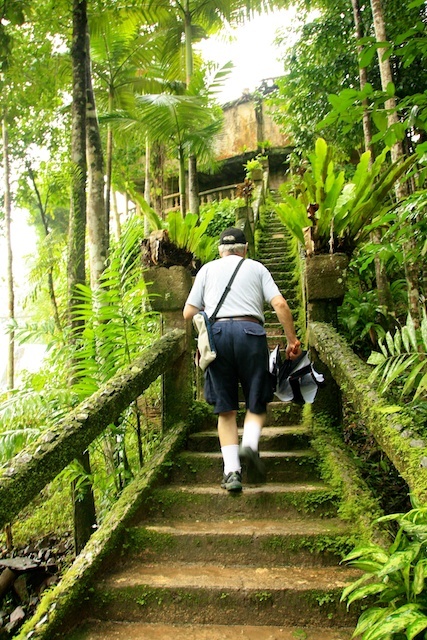 Next we were off to Paronella Park, where we will see the ruins of a Spanish castle in the jungle. 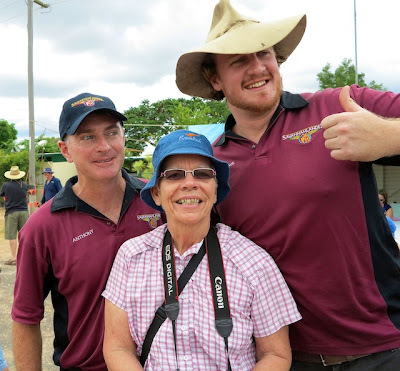 After we completed our 4 day Savannahlander Train trip we had to wait 2 days in Cairns before our 12 day tour of Cape York departed so we decided to fill one of the days with a tour of Cairns' surrounds. 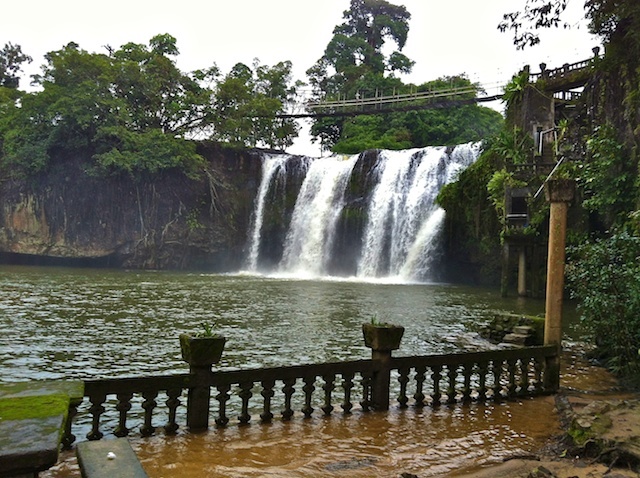 We joined 4 others for the "Waterfalls and Paronella Park Tour". Paronella Park was on my bucket list but that will be in a future post. 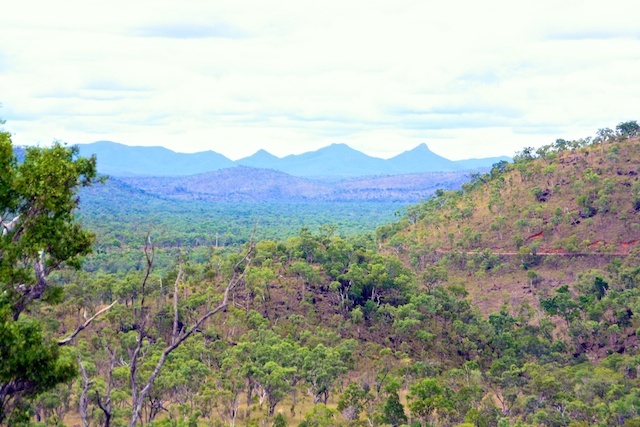 Unfortunately it was an overcast day and threatening rain but we left Cairns in a small bus and climbed up the steep Lamb Range to the Atherton Tablelands where rolling countryside is dotted with pockets of rainforest. 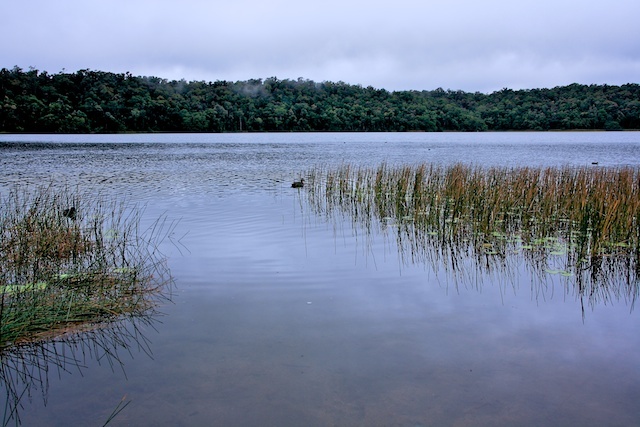 First stop was at Lake Barrine, a fresh water crater lake formed by ancient volcanic explosions. 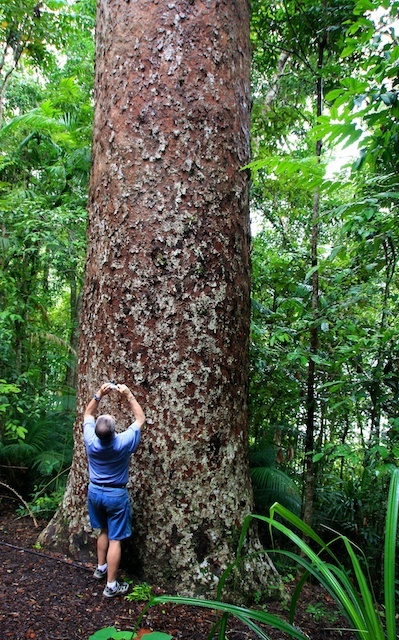 We went for a short walk through the lush rainforest to marvel at the 1,000 year old towering Kauri Trees. 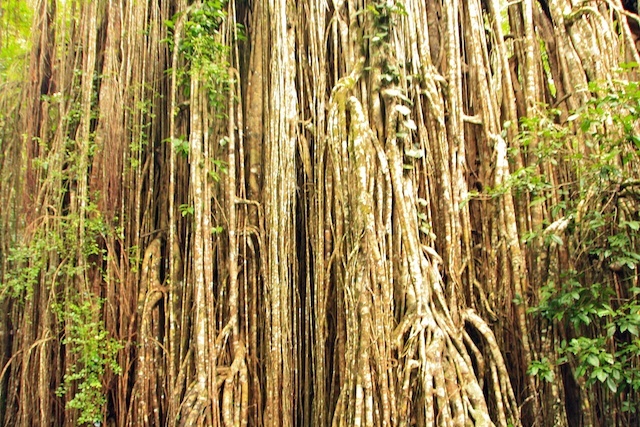 They are over 45m/135ft tall and more than 6m/9ft in girth. 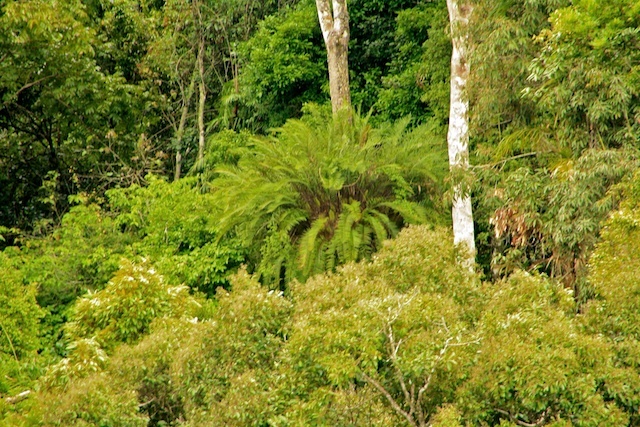 The largest of Australia's conifers. 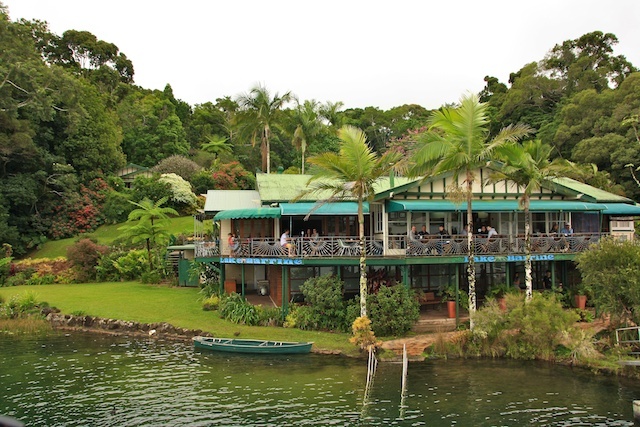 Then we were provided with a delicious Devonshire Morning Tea of scones, jam and cream in this lovely old guest house nestling on the banks of the lake. After morning tea we were taken on a cruise of the lake with an informative guide. 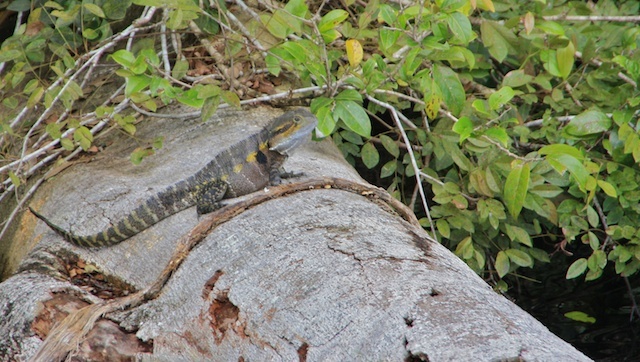 wildlife including water dragons, snakes, birds and eels. 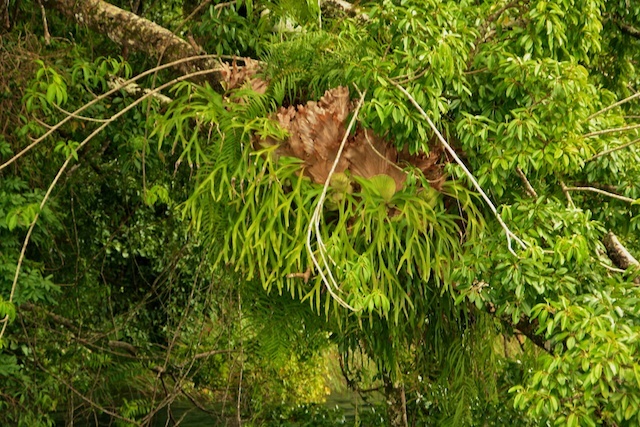 massive ferns hanging like baskets from the trees. 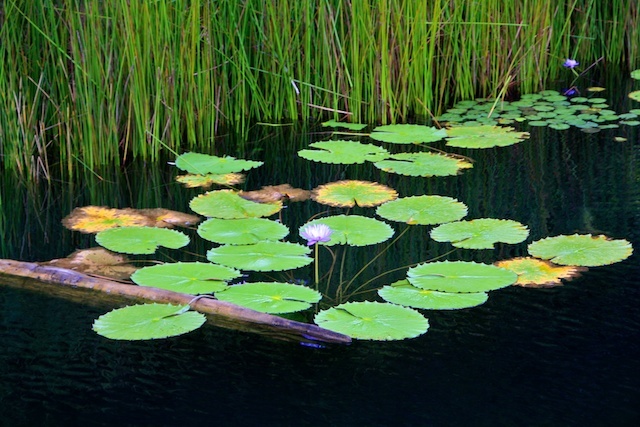 There are more species of plants in the rainforest than all the plants of North America so we were told. Even though we had grey skies it was warm and beautiful. 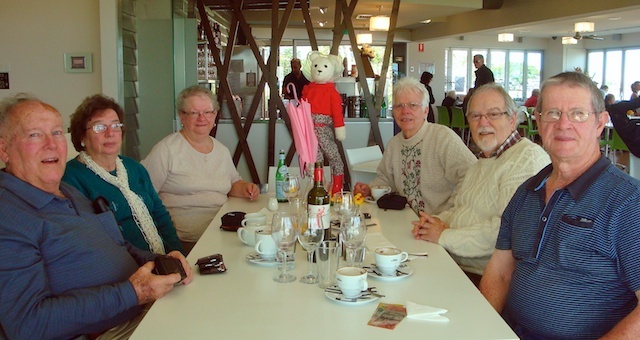 It is quite a few months since Birthday Bear has had an outing. 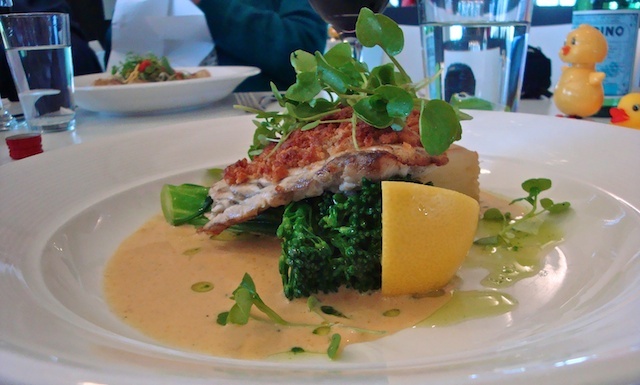 If you haven't read about our Birthday Bear tradition read here: It is my birthday on Monday but we had a celebratory lunch today. 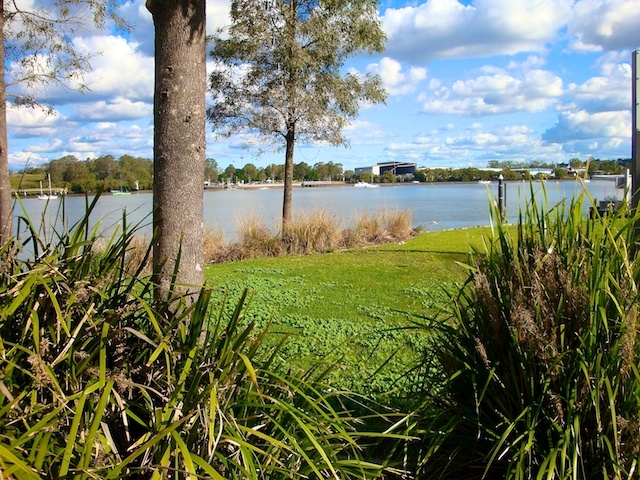 I chose to go to the Northshore Riverside Cafe as I like the view overlooking the Brisbane River. It has been raining on and off for the last week but today it was fine and cool. 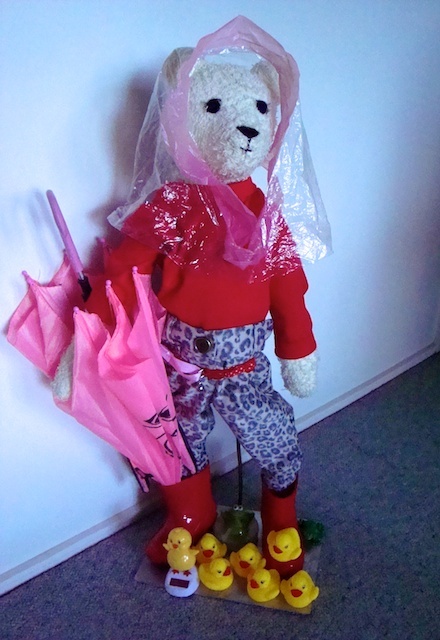 Birthday Bear came dressed for the wet weather she didn't think it was going to be fine today. 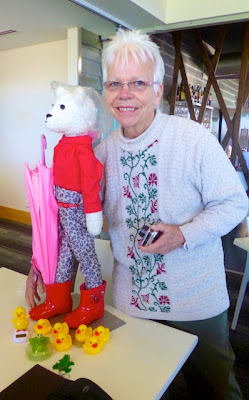 She had her rain hat, umbrella and boots. Some ducks and frogs followed her into the cafe. 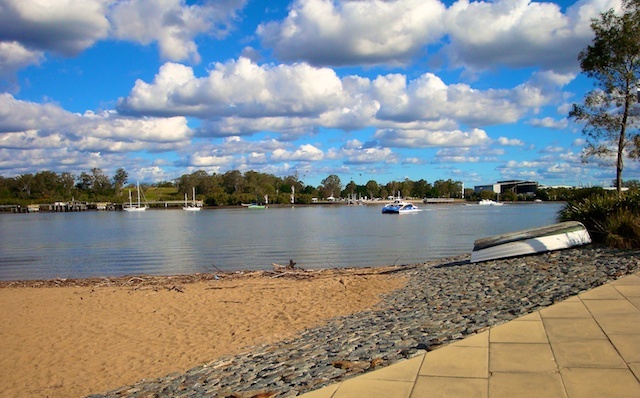 The view from the cafe over the Brisbane River. The cafe is set in a park. New apartments are being built on the river bank. I wouldn't mind the view. Looking up stream towards the city. The City Cat can drop you at the door of the cafe on weekends. Looking down stream towards the Gateway Bridge . Bear is at home with us now and happy to be in the warm dry house. Thanks to Ann for dressing Bear this time. After lunch at Almaden and watching the Great Wheelbarrow Race we climbed aboard the Savannahlander Train for the last time. 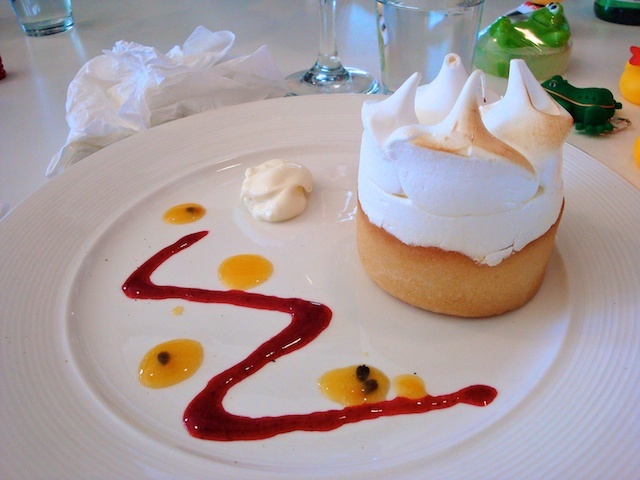 We thought Cairns, our final destination would be our next stop but we were in for a few more surprises. After an hour or so the driver stops the train and announces that we are being held up by train robbers. 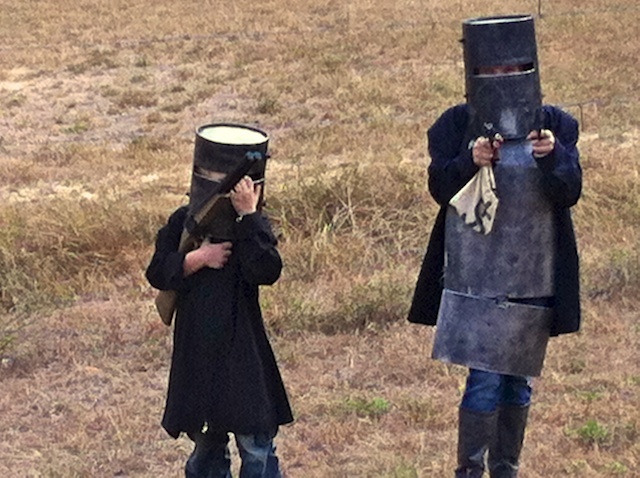 Then two little robbers walked through the carriages holding a cash bag. How could we refuse to pay up. Apparently, every Saturday when the train comes back, the drivers stop at a farm where the children board the train to take up a collection. They are saving up for a holiday by the sea. Each week they are dressed differently. 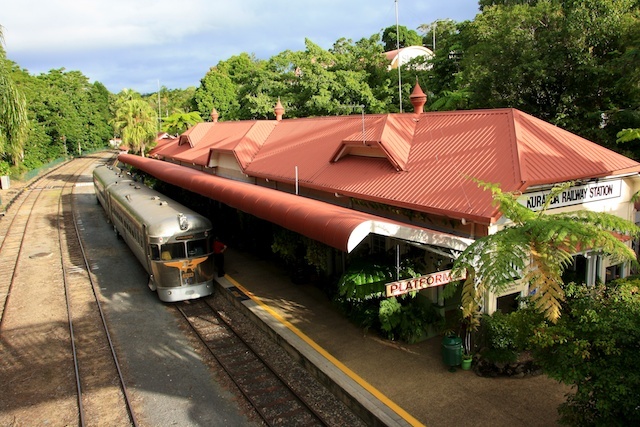 Then we had to dash to get to Kuranda Station before 4:30 as it closes down and the signalman will not be there to let us go through to Cairns so we rattled along at speed and arrived in time. Everyone gets out to stretch their legs while the station master looks on. The gardens on the station are beautiful, as I showed you before on the way up. 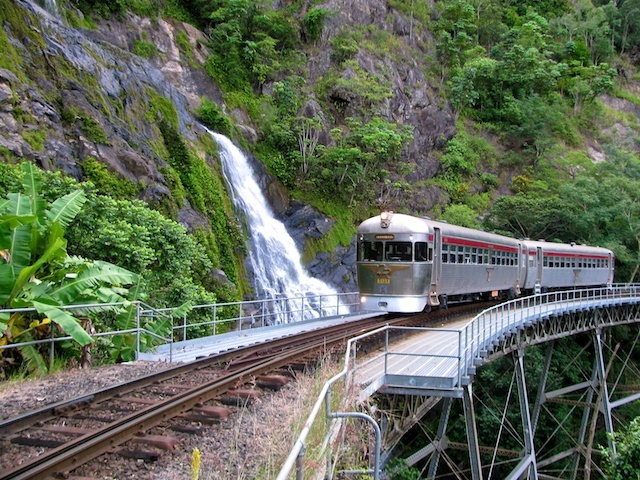 The railway line snakes its way through rainforest and down the steep Kuranda Range to the coast. 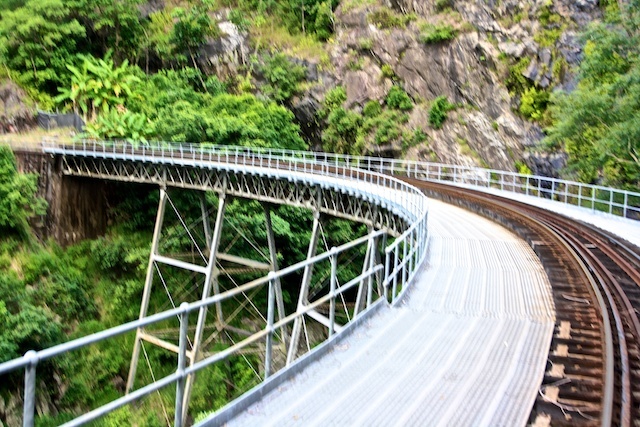 It crosses tressle bridges and passes through many tunnels. It was built by hand in the late 1800's but has been maintained and renovated since then. This is the famous Stoney Creek crossing. It often appears in travel brochures. 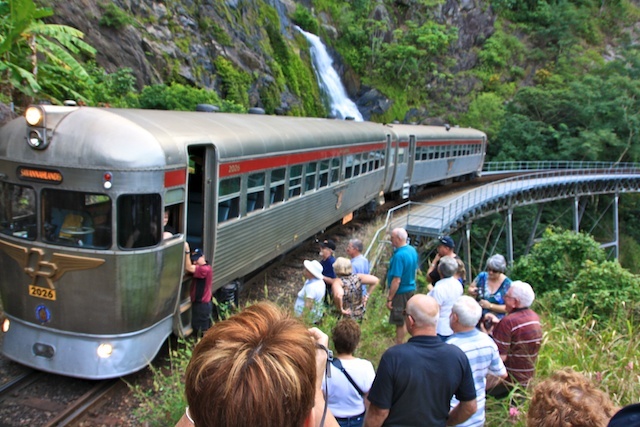 Our drivers gave us a treat by stopping the train and letting us walk across the bridge so we could take some brochure type photos of the train passing by the waterfall. Stoney Creek Falls from the bridge. The train slowly comes towards us. It is quite a breathtaking sight. Then we all piled back on for the down hill run into Cairns. This was an amazing, fun filled trip and if you are ever in the Cairns area I highly recommend 'The Savannahlander 4 day trip". There is a 6 day trip where you join another train called 'The Gulflander" and go even further west. Before we 'turned in' to our converted railway carriage accommodation at Undara we were told that breakfast would be a typical Aussie bush breakfast at sunrise. 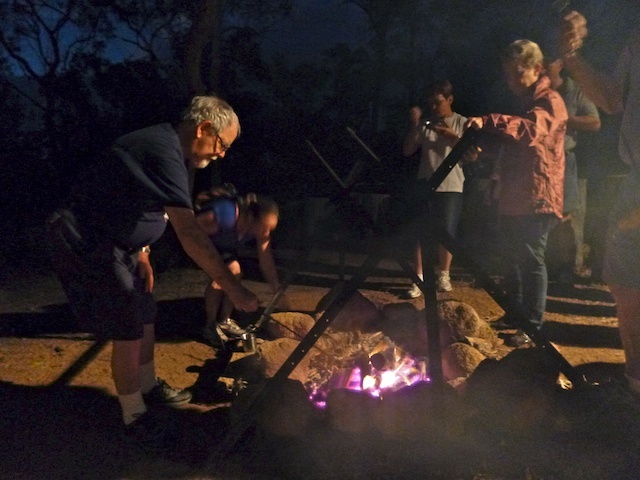 So at 6:30am we found ourselves on a short bush walk to the campfire area where a table was laden with breakfast ingredients and guests had to cook their own with the help of the staff. TOH is cooking his toast. We sat on tree stumps to eat our breakfast and watch the sun rise behind the trees. After this breakfast with a difference we were transported back to Mt Surprise railway station. Before boarded the Savannahlander Train for the last time we were invited to look at a reptile display. 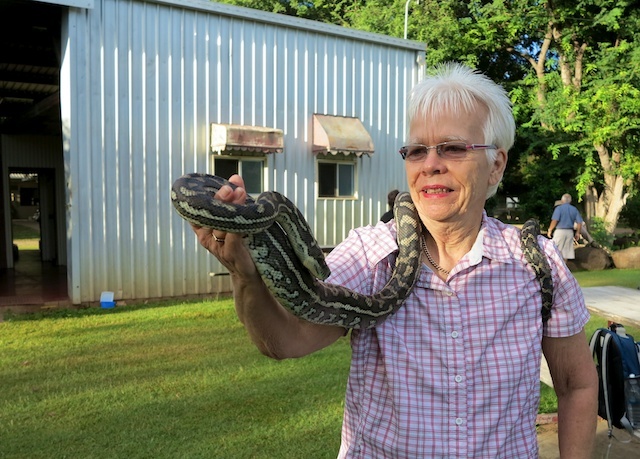 There were all sorts of snakes and lizards in glass containers but one was a friendly carpet python. 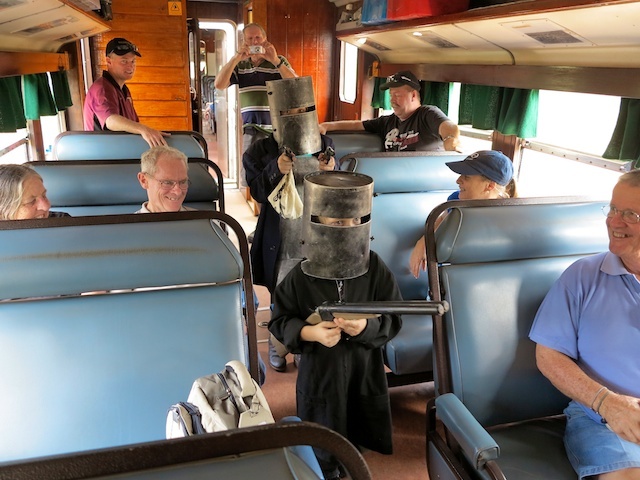 We settled back into 'our' train thinking all the fun was over as we travelled back to Cairns but when we stopped at Almaden for lunch we were surprised to see the town all abuzz with people and excitement. 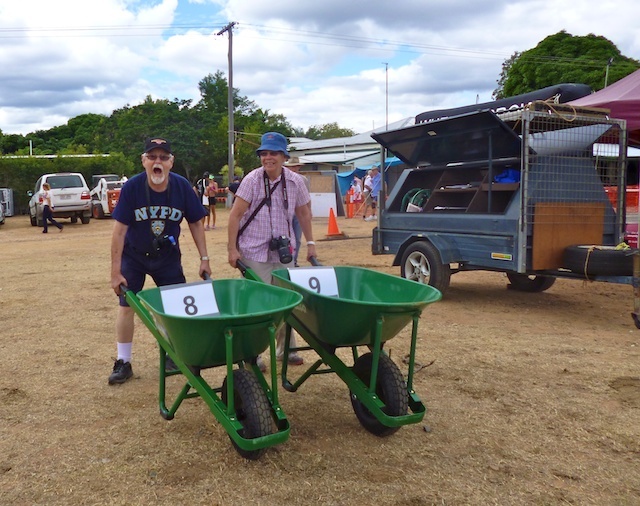 It was because the "Great Wheelbarrow Race" was in progress and the first runners were due to complete this middle section of the race any minute. The finish for the second section of the race. The small town of Almaden with a population less than 100 suddenly had a 1000 people milling around its only hotel and finish line for the Great Wheelbarrow Race. 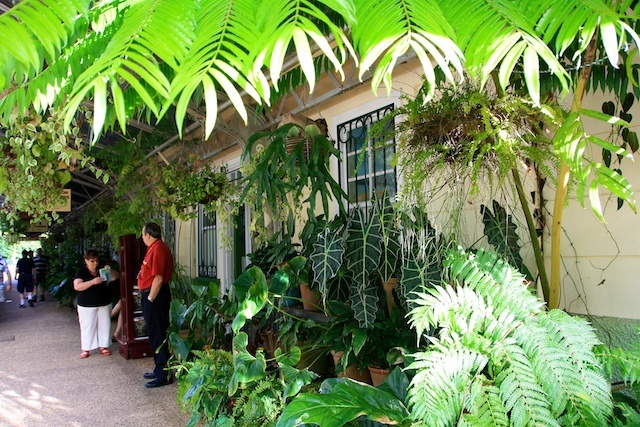 The hotel had been extended with a canvas awning out over part of the main road from Cairns to Cape York. The race lasts 3 days. There are different categories from individuals to teams. Some dress in fancy costumes and they all raise money for charity. 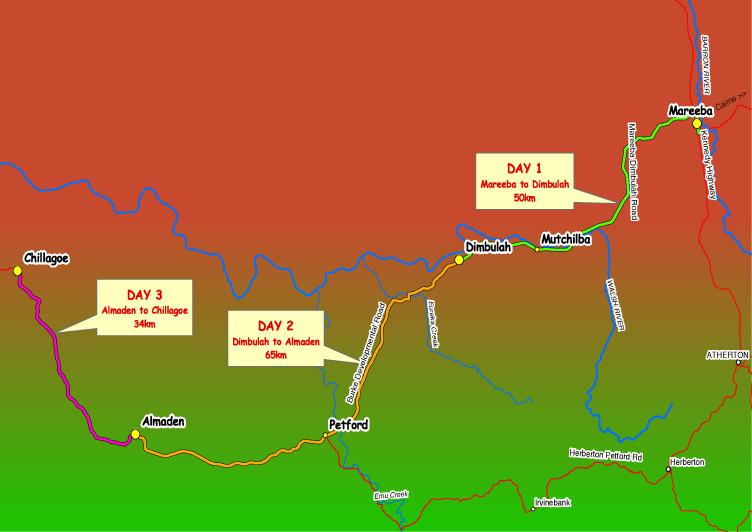 The race starts in Mareeba then to Dimbulah the first day, 44km. Dimbulah to Almaden on the second day, 63km and to Chillagoe on the third day, 33km a total of 140km. 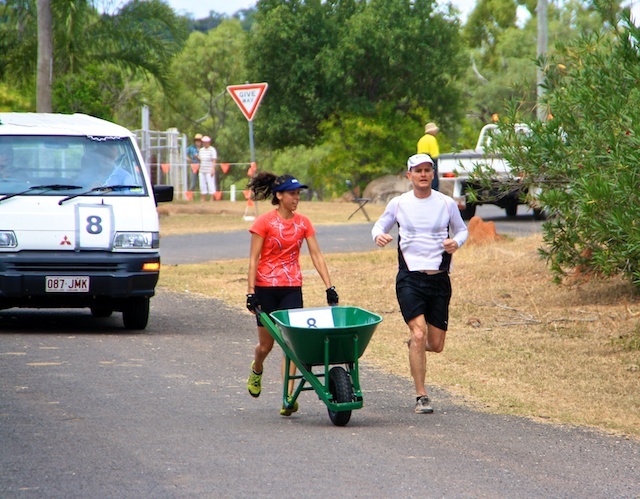 pushing a wheelbarrow. 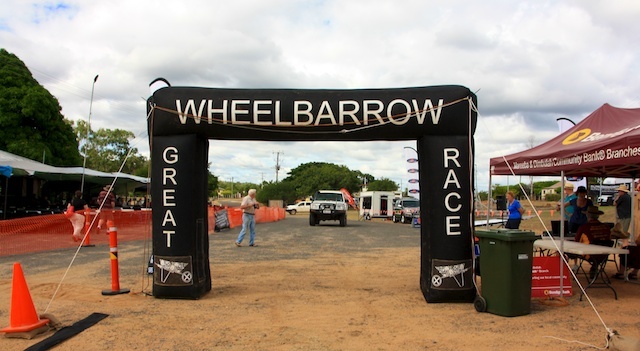 The following quote from a Mr Peel, an early settler in Chillagoe captures the essence of the spirit that is being celebrated with the development of the Wheelbarrow Way and the Wheelbarrow Race. 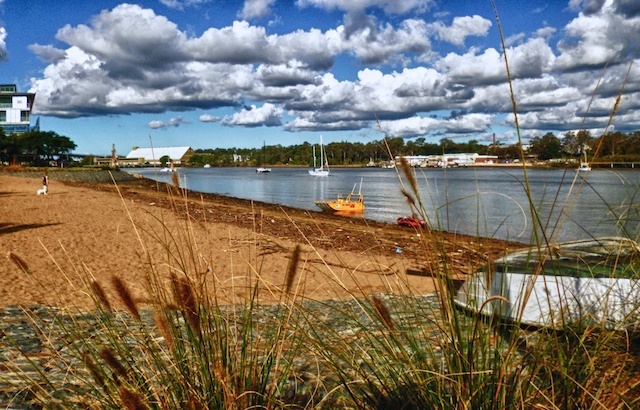 This year is the 10th anniversary of the race which honours those early settlers and also attracts tourists to the area. It also raised $450,000 for charity. Our fun drivers and guides for the last four days tell us its time to board the train again. 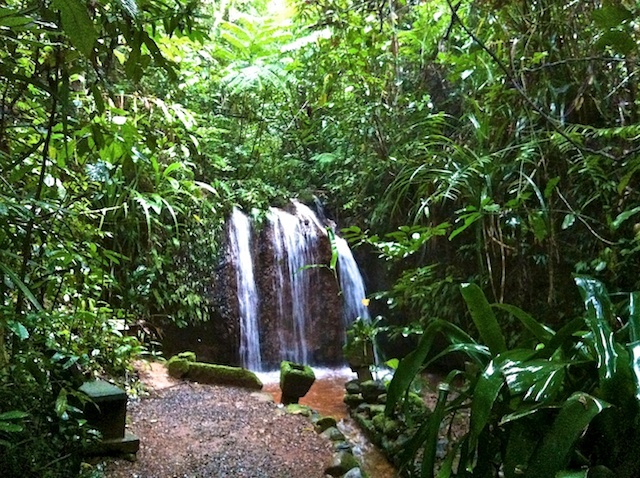 We left the Savannah country and headed back over the mountains and into the rainforest. The scenery was "pretty darn good."